A mini-world within worlds, it has something for everyone. Perhaps the greatest on-going show this side of the Atlantic is the city of New York. From sunrise to long after the stars come out, the curtain never falls on this effervescent, razzle-dazzle city. Like pieces of colored glass in a kaleidoscope, New York swirls and mutates into a hundred different patterns, juxtaposing many different worlds into the 24 sq mile island of Manhattan. First time Indian visitors experience a tinge of déjà vu, because New York has echoes of Bombay – its hustling crowds, its energy and street smarts. It, too, is a city by the sea where people come from all over to reinvent themselves, to start over and pursue their dreams. The “Indian” connection goes way back, because legend has it that the island of Manhattan was bought for just $24 in trinkets from the Leni Lenape Indians! Now Indians from India have invaded the city, manning its newsstands, its yellow cabs, its roadside dhabas – not to mention the garment and diamond district, Wall Street and the temples of higher learning, including Columbia and New York University. New York, with its frenetic energy and the neon lights of Times Square, may seem a very young city, but it has a long and distinguished history. Downtown Manhattan was the site of the nation’s first capital. It has always been the center of commerce, a bustling bazaar, which the writer O. Henry called “Little Baghdad on the Hudson.” Baghdad may have gone a different way, but New York remains a nerve center of commerce, drawing thousands on the dollar trail. The New York Stock Exchange, the largest in the world, started in 1792 when 24 brokers met under a tree facing 68 Wall Street. As late as the 1840s, thousands of pigs roamed Wall Street foraging garbage – an early sanitation system. Under the Dutch, Wall Street – where there really was a wall – was the city limit. And the aura of wealth and power is complete when one realizes that the vaults of the Federal Reserve Bank store more than one-quarter of the world’s gold bullion. New York has always attracted dreamers and wannabes, including a growing share of Indian immigrants. New York has the largest concentration of Indians of any city in America – more than 170,000 in the 2000 Census, nine times that of the next largest Indian concentration in San Jose, Calif. Indeed, fully a quarter of all Indians in the United States, over 450,000 in the 2000 Census, live in the New York CMSA (consolidated metropolitan statistical area) that stretches from Connecticut, New Jersey and New York to Philadelphia. 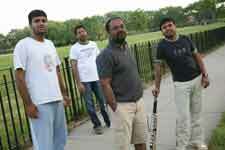 Little India projects the current Indian American population of the New York CMSA at over 650,000. You cannot travel too far in New York City without encountering an Indian. Your taxi driver from JFK Airport will likely be a Punjabi as there are close to 10,000 South Asian cabbies in New York, the single largest ethnic group in the industry. You will likely buy your newspaper at an Indian newsstand, of which there are hundreds. And if you’re hungry, a dhaba offering comfort foods like daal makhni or dosa is only a phone call away throughout Manhattan. New York has something for everybody: the compulsive shopper, the history buff, the movie-addict, the fashionista, the theater-goer, the celebrity hunter. Manhattan, the soul of New York, is just 13.4 miles long and only 0.8 miles wide at its narrowest point. Yet its vibrancy and lust for living sets the whole city twirling. 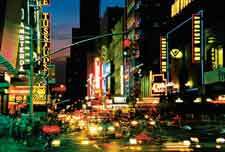 In 2005 nearly 41 million visitors trekked to New York to experience its many delights. It is a pulsating hub of more than 17,000 restaurants, hundreds of art galleries, museums and Broadway and off-Broadway theaters, and dance clubs and bars. New York is often called the Big Apple and for the curious, here is the explanation: in the 1920s and 1930s, jazz musicians who played around the country had a saying, “There are many apples on the tree, but to play in new York City is to play the Big time, the Big Apple!” Although the term was originally limited to jazz circles, an aggressive tourism campaign made the “Big Apple” and “I love NY” familiar slogans. Where do you begin in this action packed city? There are several bus tours, which allow you to hop on and off to see the various sights. First, the basics: almost all visitors stop to visit New York’s most famous immigrant – Lady Liberty, who at a height of 151 feet, is still the most stupendous figure in town. After you return by ferry from Liberty Island, take a stroll around South Street Seaport with its cobbled streets and upscale boutiques and restaurants. This is also the venue of the big Diwali Mela if you happen to visit during the Fall, with spicy street foods and a dramatic fireworks display. Tourists can get the pocket-sized Official NYC Guide with details about hotels, sightseeing, neighborhood highlights and shopping, where to stay and more. Visitor Information Counselors are also available at 212-484-1222 or you can drop in at the visitor’s center for free maps, guidebooks and assistance. 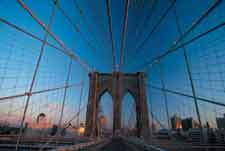 You can also buy tickets for Gray Line New York Sightseeing double decker tours and City Passes, which give front of the line access to New York city’s top museums and attractions. The twin towers of the World Trade Center are gone, but their absence looms over the city and many visitors make a pilgrimage to Ground Zero to muse about loss and longing for bygone, more innocent times. Midtown has that other towering building, the Empire State Building, which at 1454 feet is a sleek skyscraper of steel, limestone and aluminum and is rated as one of the seven wonders of the modern world. Yes, there’s no King Kong clinging to its spire, but the building stands in the midst of a shopper’s paradise with bargain shops on 34th street and of course, Macy’s the world’s largest store which occupies a full city block. The Broadway wholesale district, where many Indians deal in electronics, perfumes and watches, is just a stone’s throw away. Indian immigrants have also made their mark in the garment district, which runs from 34th Street and Fifth Avenue to 42nd Street and Ninth Avenue, and many of the businesses here are Indian-owned. About ten city blocks away is the 47th Street diamond exchange where many Indians are major players in the wholesale diamond trade. If you’re looking for Indian food during your sightseeing, there are scores of Indian restaurants in Manhattan from the very upscale to basic dosa joints. For quick bites on the run you have Minar, Dimple, Yatra. You can even catch Indian food from a vendor’s cart, although be warned, the lines can be long at lunch time! Manhattan has its very own Little India on Lexington Avenue, also known as Curry Hill. Here you can pick up Indian groceries, spices, movie videos and CDs and eat every kind of street food, from bhel to Indian Chinese dishes. If you’re hungry for culture, New York is a feast. Lincoln Center offers opera, symphony, dance, theater, films and a comprehensive library of the performing arts. Fifth Avenue’s Museum Mile has some of the most amazing museums, including the Metropolitan Museum of Art, Guggenheim Museum and the American Museum of Natural History. If you’re traveling with children and want to show them something about their Indian culture, the Metropolitan Museum of Art (www.metmuseum.org) as well as Asia Society (www.asiasociety.org) on Park Avenue both have ongoing exhibits of Indian art. The New York theater attracts visitors in droves, from the long running Broadway shows like Phantom of the Opera to the latest and hottest. It is a city of actors and arc lamps, and hundreds of theaters sprout all over the city – in bars, churches, lofts and basements. Sometimes you can unearth real gems. If you’re on a shoestring budget, the half price ticket booth called TKTS on Broadway at 47th Street (www.tdf.org) is a real dollar saver. Here you can pick up day of performance tickets at half price for many Broadway and off-Broadway shows. Celebrate your love of food during Restaurant Week, a bi-annual dining promotion that offers great deals with bargain three-course prix fixe-lunches and dinners. This summer it falls on July 10-14 and July 17-21. More than 200 of New York City’s best eateries participate every year to showcase the variety of the city’s restaurants. If after dinner, you still want to paint the town red, New York is an obliging canvas. Nights spots, jazz clubs, wild discos are just flexing their muscles and getting ready for action. The city that doesn’t sleep doesn’t miss a beat either. It is possible to party all night until the wee hours of the morning. It is also the city of 24-hour delis, supermarkets and even all-night hair-dressers. Interestingly enough there are also some 24-hour Indian restaurants catering to taxi drivers, and in Queens, there are even 24-hour Indian supermarkets. Times Square, where the ball drops on New Year’s Eve, is known to just about everyone. A stroll down the square is a must to capture its energy and color. In recent year, Times Square, which earlier had acquired a seedy reputation, has been cleaned up and sparkles with restaurants, hotels, stores like the Toys R US Times Square, which boasts an indoor 58-foot ferris wheel and a two story life-size Barbie dollhouse. New York’s neighborhoods are worlds within worlds and you can step into Koreatown, Little Italy or Chinatown. Take a bus or train to the Upper East Side, Soho or Harlem and you will find new worlds and new experiences in each area. Other boroughs such as Queens are home to thriving mini cultures, including enclaves of Greeks, Koreans, Jamaicans, Indians and South Americans, each bringing their own distinct heritage. If you’re into sports, Madison Square Garden, a huge indoor arena, and Yankee and Shea Stadiums all play host to popular sporting events. For speculators, there are Belmont and Aqueduct racetracks, which are a train ride away. Shopping is one of the pure delights of New York. From the elegant floodlit department stores to the hawker’s cart, the city brims with consumer goods. Besides the fabled shopping on chic Fifth Avenue and Madison Avenue, there are major department stores, boutiques and temples of designer goods. If you want something a little wild or out of the ordinary, SoHo won’t disappoint you for a plethora of unusual boutiques has sprouted up there. In fact, only a quarter of a square mile, SoHo has an estimated 250 art galleries, four museums, nearly 200 restaurants, and 100 stores! If you’re visiting in summer or winter, check out the city’s official seasonal promotions (Summer Breaks in summer, Paint the Town in winter) for great discounts. A little known secret is that discounted designer goods, linen, lamps and clothing are available on Delancy, Orchard and Grand Streets in Lower Manhattan, close to Chinatown. Those wanting to shop outlets will be surprised to know that Woodbury Commons, with its hundreds of stores with discounted merchandise, is just a short train ride away. For star-gazers, New York is the Hollywood of the East Coast. Besides bumping into celebrities in restaurants, one may even see movies in progress. Recently you could have caught Shahrukh Khan and Preity Zinta shooting on the streets of Manhattan, without causing a stir, leave alone a traffic jam. Yet, perhaps the best shows in New York are free. This city boasts live shows on every sidewalk. Like some lively souk out of a fairy tale, New York swarms with the rich, the not so rich, the homeless, the conmen and crooks. One hurtles through its traffic laden streets in a yellow cab or edges through its swarming crowds on the sidewalks, which are crammed with pedestrians and hawkers touting everything from counterfeit watches to umbrellas on rainy days. In summer the streets turn into a virtual street fair as mime artists, break dancers, sidewalk artists and souvlaki vendors turn the streets into an open air stage. Street fairs are dear to the heart of New Yorkers. Arts and crafts, books, junk jewelry and Made in China toys all spill onto the sidewalks. And New Yorkers love a parade. There are parades for any and every reason as Italians, Indians, Hispanics, Orientals and Irish, to name a few, take to the streets on their special days to celebrate their cultural heritage. India has its day in the sun with a huge parade down Fifth Avenue for the India Day Parade, which culminates in a samosa and kulfi laden street fair with bhangra music. Macy’s Thanksgiving Day parade is a massive event where hundreds of spectators join in and tap dance down the avenue and huge balloon effigies of celebrities like Snoopy and Elmo tower over the city as stage and screen personalities entertain the crowds. There are countless tour buses for sightseeing yet the cheapest way is to don a pair of sneakers and arm yourself with a street map. New York is built on a grid and is a city of walkers, so it’s possible to catch most sights simply by putting one foot in front of the other. Life is never dull in New York. Ever so often you hear the wail of a siren as a police car or an ambulance hurtles by. Yet this is the same city where you can be lost in the silence of eternity in a meditation center or the depth of millions of books, bursting with wars, vengeance, drama – yet not making a sound as they lie mutely on the shelves in the silent library. You can sit on the granite steps of the imposing New York Public Library next to Patience and Fortitude, the two stately granite lions at lunchtime along with countless other shoppers and office workers and watch the world go by. The subway trains operate around the clock, connecting the city to the other boroughs with 490 stations and thousands of miles of tracks. Little India reported that an estimated 2,500 Indians work in the Metropolitan Transportation Authority, making it perhaps the largest single employer of Indians in the United States. As long as you don’t come out of the subway, you can ride the trains all day for $2! This flat charge can take you to almost any part of New York City or the other boroughs. How would you like to take a trip around the countries of South Asia in less than a day? No airline tickets to buy – all you need is a Metrocard, for India, Pakistan and Bangladesh are all in Queens. Queens is the most ethnically diverse 115 square miles on earth. The 7 subway line has been dubbed The International Express and has been designated a National Millennium Trail for its representation of the immigrant experience. Jackson Heights happens to be the microcosm, the very pulsating heart of South Asia. For most new immigrants Queens has been anchor and safe harbor. While many have settled in Corona, Elmhurst, Flushing, Richmond Hill and Astoria, Jackson Heights has been so popular that it’s jokingly called Jaikishan Heights. The main action is on 74th Street, although the South Asian area spreads from Roosevelt Avenue to 37th Avenue, from 70th to 78th Street. In fact, 74th Street itself has been renamed Kalpana Chawla Way as a tribute to the Indian American astronaut who died in the Space Shuttle Columbia tragedy. According to Shiv Dass, president of the Jackson Heights Merchants Association, there are over 200 Indian businesses in this one-mile stretch, including over 20 restaurants and 9 sweet shops. There are more than 30 jewelry stores with an inventory worth millions of dollars on this one street. Indeed, 74th Street is the mother of all bazaars, because it has almost a dozen grocery stores, which carry thousands of ethnic products from the sub-continent as well as UK, U.S. and Canada. Back in Manhattan, you can catch the new phenomenon of Indian owned art galleries, such as Bose Pacia Gallery, Sunderam Tagore Gallery, Talwar Gallery, Gallery Arts India and the Sepia Gallery. Here you can buy art from major Indian as well as Indian-American artists. Yes, it’s possible to go back from your trip with a M.F.Husain painting or a Souza under your arm, because New York is also the home of Christies and Sotheby auction houses, as well as dealers in South Asian art and antiquities. Want to catch a desi movie? While the suburbs have several theaters that screen only Indian movies, in Manhattan Hindi movies often screen at the Imaginasian Theater or the Virgin Cineplex on Times Square. It’s always a fun feeling to watch a Shahrukh Khan movie in the midst of the colorful chaos of Times Square. Each new day brings trade shows, conventions and social events to this bustling city. The city rushes on, its revolving stages showcasing the best in high finance, commerce, art, dance and drama. You can almost smell the excitement. Exhausted, you may want to put your feet up, but in New York, the glittering show goes on! Take the No. 7 line to 74th Street-Broadway. The underground Roosevelt Avenue-Jackson Heights station is a major transfer point for the E, F, G, R and V subways. Where to shop on 74th Street – just a sampling of hundreds of stores. 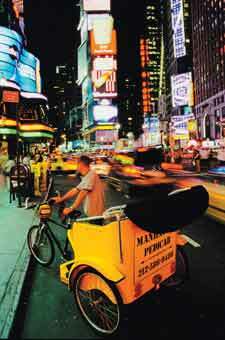 John Hertz, who founded the Yellow Cab Company in 1907, chose yellow because he had read a study conducted by the University of Chicago that indicated it was the easiest color to spot. Manhattan and Staten Island are islands; Queens and Brooklyn are on the western tip of Long Island. So, of New York City’s five boroughs, only the Bronx is part of the mainland. However, there is an island that’s part of the Bronx and yet feels like a New England fishing village: City Island, a marine-related community offering fishing, boating, and a wide range of restaurants and snack bars. The world’s largest gothic cathedral is the Cathedral Church of St. John the Divine (212) 316-7540 – and it’s still under construction. Its first stone was laid in 1892. New York boasts several Indian restaurants from the high priced to medium and the really cheap. Within Manhattan, there are two major concentrations of Indian restaurants. Curry Hill: Manhattan’s Little India is on Lexington Avenue between 28th to 30th streets. 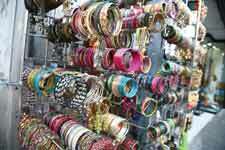 It has an array of reasonably priced Indian restaurants, grocery stores and music and video shops. 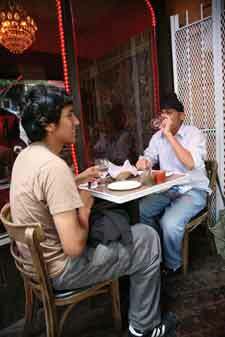 East Village, 6th Street between First and Second Avenues has several low-priced Indian and Bangladeshi restaurants.